ESPA kindly invited me along to their #SummerBeauty event at the Beauty Bazaar in Liverpool this past Thursday. Myself and my lovely local blogging gals descended on the store at 6pm, having the WOW champagne bar exclusively to ourselves and a never empty glass of champers in hand, we embarked on our luxury ESPA spa journey. Having been put into small groups of 4 (it was a very small, intimate event which I loved, there was only 12 people here in total! ), we headed to our first ESPA experience. First up, I had a detailed skin analysis, based on aromatherapy. Turns out the scents we are drawn to can tell us a lot about what out skin needs. Letting my nose guide me, I ended up choosing the hydrating floral spa fresh (£24), and the replenishing face treatment oil (£56). My senses were gravitating towards the hydrating products. After my aromatherapy journey, I had my hands on skin analysis. The therapist smoothed her hands across my face, checking for bumps, congestion, elasticity, and overall skin condition. The results? She deemed my skin to have great elasticity (youthful win! ), no congestion or puffiness, a few bumps near the hair line but overall, very well exfoliated, and, which was the biggest surprise to me - she said my skin was actually pretty dehydrated and not as oily as I’d previously told her. She said my forehead had some oil, but the rest of my skin was leaning towards a dry/normal combination. I was then gifted with the cutest little cosmetics bag filled with everything I would need for an at-home replenishing facial. Our little group headed back into the WOW bar where we were greater with more champagne and delicious, oh so fancy pants, canapes. As we sipped and supped another ESPA therapist talked us through their exciting new Summer Beauty collection. 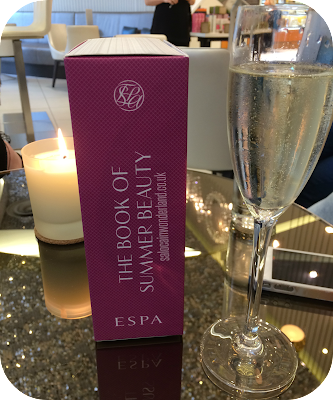 Their limited edition book of summer beauty (£24) contains their three top best sellers that allow you to create the ESPA experience at home; optimal skin proserum, 24hr replenishing moisturiser and their holy grail product, pink hair and scalp mud. I won’t lie, as expected about everything in this little collection as I am, the pink hair and scalp mud really had me intrigued. Not only is it an intensive hair and scalp treatment, it’s ideal for dry skin, stretch marks and the highlight of their prenatal spa treatment. This really is a multi-tasking wonder and I’m really excited about trying it out! We also had a little play around with their new, gradual self tan (£34) - which works with your skins natural ‘if you sit in the sun and get a tan’ colour, to give you a streak-free, nice smelling, natural looking tan. And the limited edition pink pomelo lip balm (£10) - this, I almost, almost went home with (and still might go back and pick up!). Not only was it insanely moisturising but it lasted on my lips well over 3 hours! That’s impressive! Next up, we had an intensive hand and arm massage. I’d been having a pretty crappy week this far, so some serious, deep tissue pampering was very much appreciated! The therapist started by scrubbing my skin with their exfoliating body polish (£32). There are no words as to just how divine this was, I could instantly feel the stress being pulled from my skin. After a thorough scrub, she then applied the cooling body moisturiser (£34). I had to ask had this been kept in the fridge? It was that cold on my skin and the burst of soothing lavender instantly had me sighing with blissful relief! Holly, Jackie, Laura, Leanne, Me and Hannah! 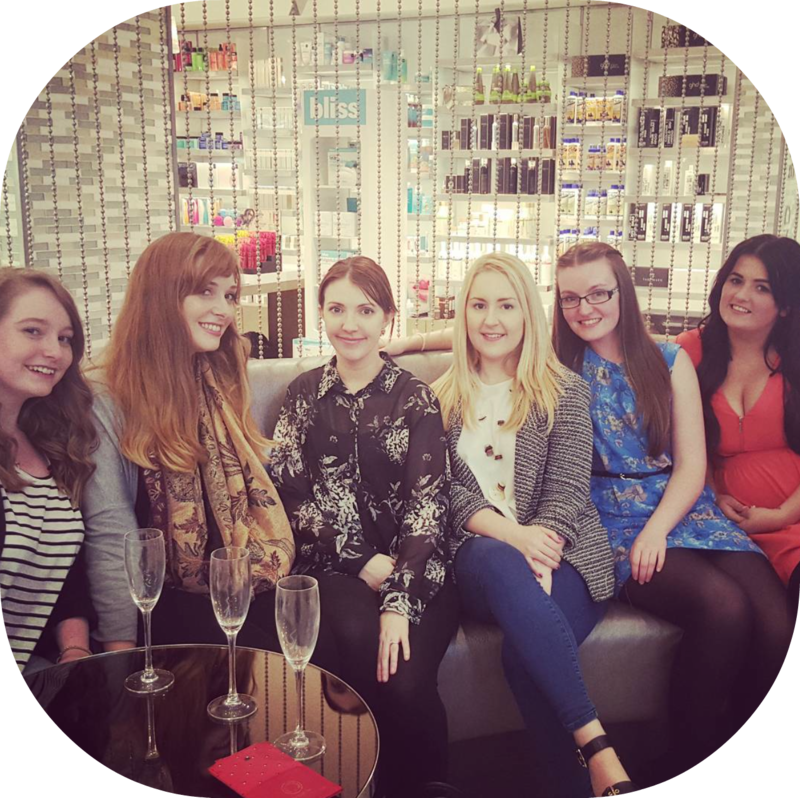 Once all the groups had finished up their treatments we headed back into the WOW bar to find a ESPA goodie bag on our chairs and a final goodbye from the ESPA team. Then then left us to catch up, have a giggle, drink some more champagne and rummage through our goodie bags until well past store closing! I had an absolutely fabulous evening. The team took amazing care of us all from start to finish, and I really did learn a lot, not only about their products but about skincare in general. I’m very excited about trying out their spa treatments, especially the hour and a half back scrub, massage and full facial they offer for only £65 - which is then redeemable on purchases made at the counter! 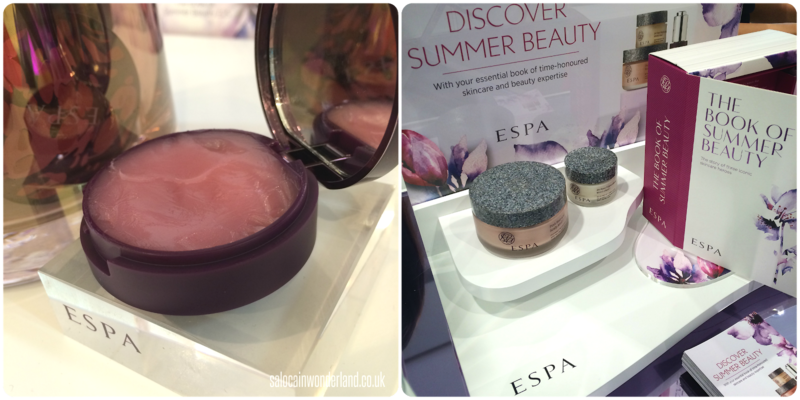 I’ve talked about my love for ESPA and their products before but the chance to have a more in-depth experience was one I couldn’t pass up and it has only strengthened my love for this brand. 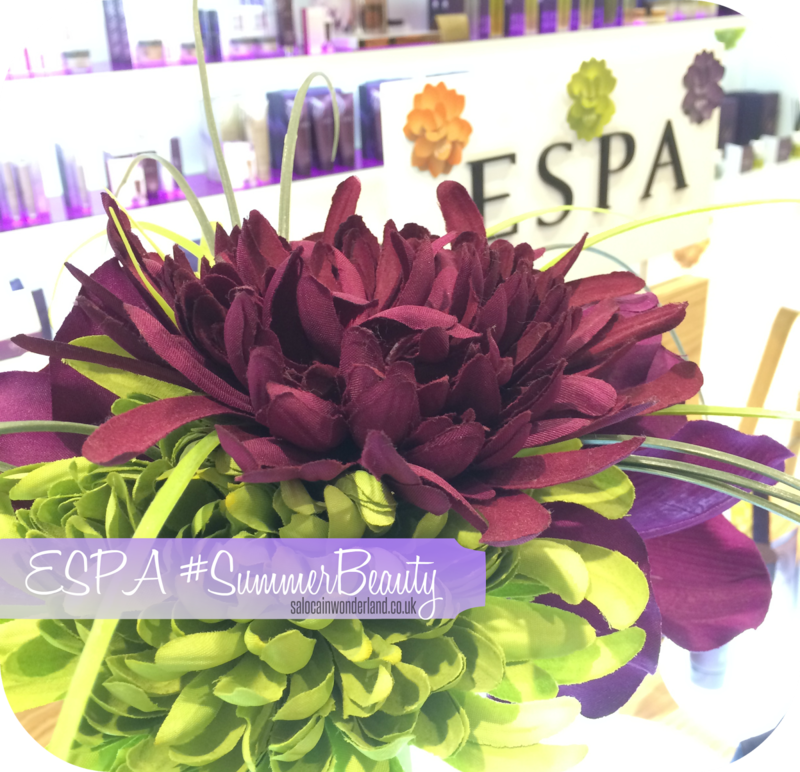 Thanks again to the ESPA therapists at the Beauty Bazaar for having us, you’ll be seeing me again soon that’s for sure! What’s your favourite luxury spa treatment? Let me know in the comments below! I love it when ESPA are at events, they always have great goodie bags. I had to smell which skin type I was, too! Ha. 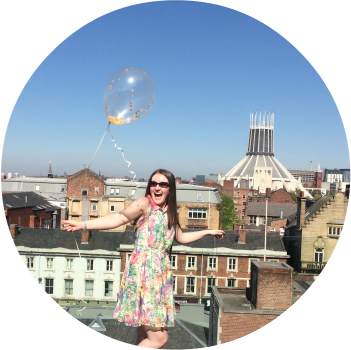 They are by far one of my favourite brands to work with - they love bloggers and are SO generous with their goodies and time!